Super Bowl Snack Tips by You! 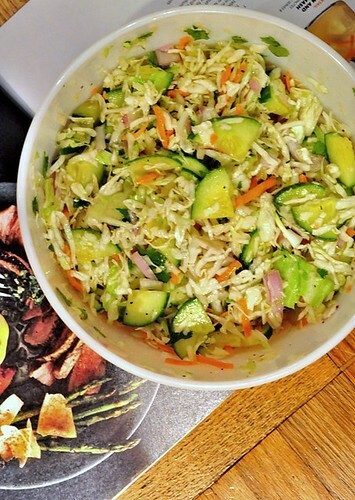 FD fan Amie made this delicious Spicy Zucchini Cole Slaw. Are you excited for the big game on Sunday? Judging from all of your posts, tweets and mentions on our Facebook page, you’re ready to nosh on some tasty comfort food (corn chowder, pulled pork sandwiches, pizza) as well as dive into some classic party foods (salsa and chips; veggies and dip; cheese and crackers). We asked our fans for their healthier Super Bowl tips and you did not disappoint! From Eggplant Fries to Parmesan Popcorn, our customers have the best ideas! MaryAnn Jones, from Manhasset, Long Island, NY says, for her, “The keys to Thriving during a snack-a-licious party are balance & control.” She likes to eat a satisfying snack like a handful of almonds or walnuts before the big game…. Filed Under: You Said It! Tagged With: entertaining, football, Game On, healthy, party picks, Super Bowl, tailgating, vegetables, You Said It! Think Kids Meals are just for kids? Think again… 28-year old FreshDirect customer Kim Gorode, used FreshDirect Kids Meals (and our other 4-Minute Meals) plus healthy snacks and exercise to shed 40 lbs – going from a size 14 to a size 4 in less than a year. Filed Under: You Said It! Tagged With: Kid Power, You Said It! ThanksTrivia! Check out our Thanksgiving Fun Facts! How many football fields do you think we could surround with all of the pies our FreshDirect fans enjoyed last Thanksgiving? We know our customers love food. But would you believe that, last Thanksgiving, our customers ordered so many cans of pumpkin that we could have made a giant tower out of them? Check out this cute photo below for more of our fun Thanksgiving facts! And search for #ThanksgivingTips on Twitter (@FreshDirect) (or just click on this link) to see more of our fun facts and great recipe ideas for a healthy holiday! Filed Under: You Said It! Tagged With: You Said It! DIY ice pops are a good choice for kids who have one of the 8 most common food allergies. I love to entertain – especially for kids. My little nieces, nephews and cousins all get so excited when they see tables topped with colorful fruits, cupcakes and other goodies. Recently I attended a kids party and noticed all of the detailed food labels. The hostess told me that a handful of the kids had food allergies and this was one way to keep them safe. Amongst my friends and family, it seems that food allergies in kids are on the rise. A recent study published by Pediatrics confirmed this observation. According to the FDA, the 8 most common food allergies are milk, eggs, peanuts, tree nuts (e.g. almonds, cashews, walnuts), fish, shellfish, soy and wheat. Filed Under: You Said It! Tagged With: dessert, entertaining, fruit, kids, safety, tips, You Said It! School’s out, summer’s here and the open road awaits. For thousands of families, that can mean only one thing: ROAD TRIP! So many of my friends are new parents, and they’re always looking for ways to feed and entertain their kids on the road. Filed Under: You Said It! Tagged With: easy, fast, fruit, kids, Nutrition, snacks, summer, travel, vegetables, You Said It!